Whether you're in the market to start acquiring a set of silver Roosevelt dimes or you are looking to sell your existing Roosevelt dime collection, you will need to know your coin values and prices. You can also find out how much your Roosevelt clad dime (1965-Date) is worth if you are interested in collecting them too. In 1792 the United States government passed an act that authorized the Treasury Department to produce coinage for the United States. Dimes or ten cent pieces were first struck in 1796. The original alloy of United States dimes consisted of 89.24% silver and 10.76% copper, weighed 2.7 g and had a diameter of 19 mm. Compared to the classic silver Roosevelt dime composition of 90% silver and 10% copper, slightly smaller at 17.9 mm and somewhat lighter at 2.5 g. All dimes ever made by the United States Mint all have reeded edges to prevent clipping of silver from the coin. Roosevelt dimes currently minted contain no silver and are composed of a pure copper core bonded to clad layers of copper-nickel (75% copper and 25% nickel). President Franklin D. Roosevelt died of a cerebral hemorrhage in 1945. Because of his work with the March of Dimes, the United States Treasury Department decided to commemorate his legacy with a new design on the United States dime. John R. Sinnock created the design for both the obverse and the reverse that is still in use today. Roosevelt's portrait on the obverse is facing left and also contains the inscriptions of "Liberty" and "In God We Trust." The reverse consists of a torch flanked by an olive branch on the left side and an oak branch on the right side. These branches symbolize peace and strength. The United States Mint currently makes Roosevelt dimes for circulation. However, a copper-nickel alloy is currently used to make these dimes. In 1964, the mint made the last dimes containing 90% silver. Most circulated Roosevelt dimes are only worth their bullion value. 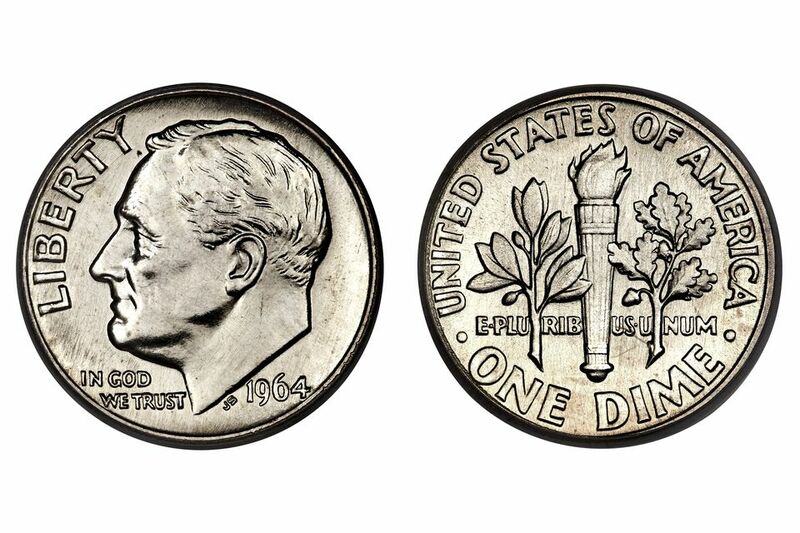 However, a beginning collector may want to start a collection of silver Roosevelt dimes by digging through a coin dealer’s “junk bin” to fill their coin folder with circulated examples. When it comes time to sell your silver Roosevelt dime collection, remember each coin 0.07234 Troy ounces of pure silver. Uncirculated and proof coins will bring even more money than circulated examples. If you want to get the most money for your Roosevelt silver dimes, you need to sort them and organize them so the coin dealer can quickly see what you have. The United States Mint produced Roosevelt silver dimes at three different mints: Philadelphia (no mint mark), Denver (D) and San Francisco (S). As illustrated in the picture link below, the mint mark is located on the reverse of the coin, near the bottom just above the "E" in ONE and to the left of the base of the torch. The following table lists the buy price (what you can expect to pay to a dealer to purchase the coin) and sell value (what you can expect a dealer to pay you if you sell the coin). The first column lists the date and mint mark (see the photo link above) followed by the buy price and the sell value for an average circulated silver Roosevelt dime. The next two columns list the buy price and the sell value for an average uncirculated. These are approximate retail prices and wholesale values. The actual offer you receive from a coin dealer will vary depending on the actual grade of the coin and some other factors that determine its worth. B.V. = Bullion Value. You can check the current bullion value of all U.S. silver coins.